HMMA Team Member: Chris Weihe | Hyundai Motor Manufacturing Alabama,LLC. 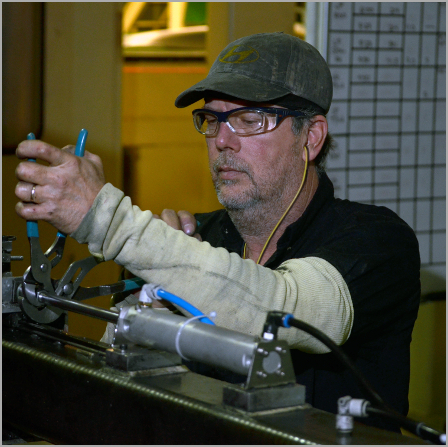 Stamping maintenance Team Member Chris Weihe joined the Hyundai family nearly 12 years ago on August 18, 2003. When Chris first came to work at HMMA, the landscape looked a lot different. “It was still dirt out here,” he said. “The weld shop had a roof, but they were pouring concrete and setting the slabs under the roof. In the stamping shop they were in the process of putting the roof on. Over the next two years, Chris and his fellow Team Members watched as HMMA’s shops took shape. The stamping shop was cranked up to begin the process of transforming rolls of steel into the car body panels that would go on to become Hyundai vehicles. No matter how slow things may have been to start, Chris says it was a rewarding experience to see the assembly process in action. And now, 12 years later, when he sees an Alabama-built Hyundai on the road, Chris says that good feeling is still there. Thanks to dedicated maintenance Team Members like Chris, HMMA’s first 10 years of production have run like a well-oiled machine.